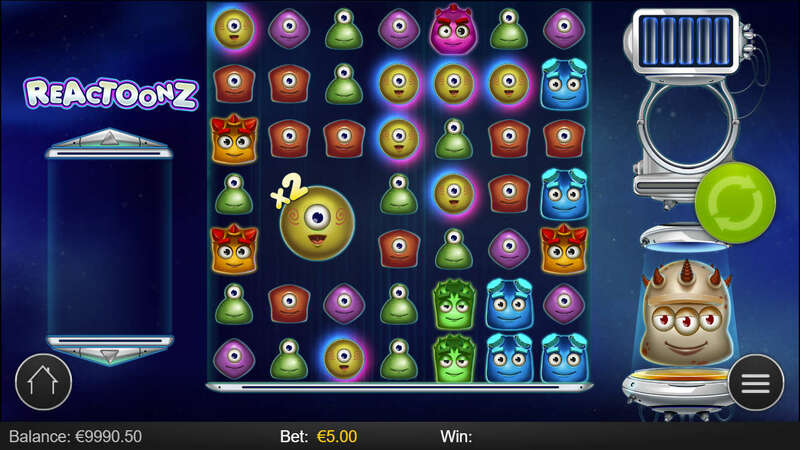 Reactoonz is an alien-themed video slot game that has proved to be very popular among video game players. Created by the leaders in software development, Play’n Go, this game features amazing 3D graphics. In addition, it has lots of bonus features, and a large value top cash prize. Read on to find out exactly what we thought of the game and why you should give it a try. 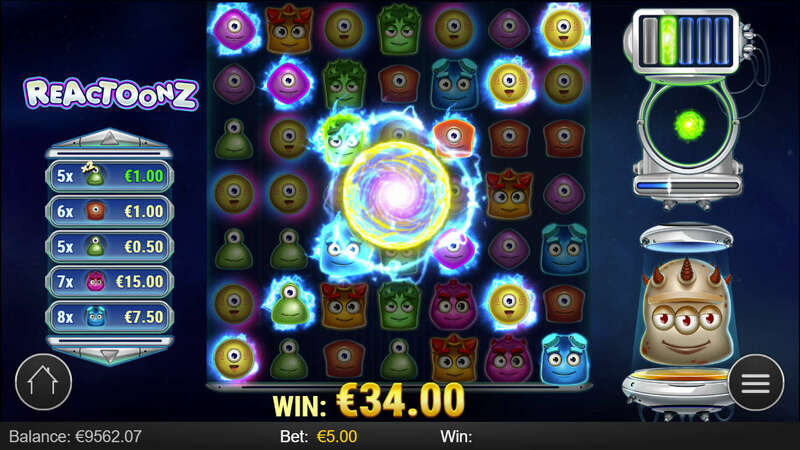 Reactoonz is played on a 7 x 7 grid. It uses cascading reels to reveal (hopefully) matching symbols as you play. You will need to match at least 5 symbols, either horizontally or vertically to make a winning combination. The symbols used in the game are colourful and cute alien faces. There are eight characters, which are all different colours. Players can also create wild symbols through gameplay by either forming a combo with a glowing symbol or you might receive them as a gift from the Gargantoon (- we’ll explain later) on a non-winning spin. It could be argued that the bonus features of this game are the best thing about it – they certainly ramp up the fun. Every time you form a combo you charge up the Quantum Leap bar. Once this is full up it activates one of the 5 Quantum features, which all transform symbols in different ways to help you make even more combos. The best of these Quantum features is the Gargantoon which comes into play once you have used the other four features. He normally sits to the right of the reel but he wakes up when you have played all other features. He creates a 3 x 3 wild symbol for one spin, which becomes two 2 x 2 symbols on the next spin and 9 single wild symbols on the third spin. This game is extremely high in volatility. This is a feature that is formed when you match 4 symbols in a 2 x 2 square formation. You will see a bigger version of the symbol that you have matched form on the reels. This initiates a 2 x multiplier for any wins made using this symbol. Basically, winnings will be doubled when a combo is formed using the giant symbol. For every spin one of the one-eyed symbols will be marked out from the others as a fluctuating symbol. This is normally a low-value random symbol and you can tell which one it is because it glows. If this symbol appears in a winning combo it will leave behind two wild symbols. Those can then be used as substitutes for other symbols to help you form winning combos. Reactoonz is a really fun game to play. All the extra features really do pack a punch and make you want to keep coming back for more. It might sound complicated but once you start playing, you will see why we love it! It is really easy to be drawn right into the game. You also have the potential for big wins with this game, indeed the top cash price is 4750 x your initial stake. The RTP is also fair too, which means that you have a good chance of winning something when you play this game. Where to play Reactoonz slot then?